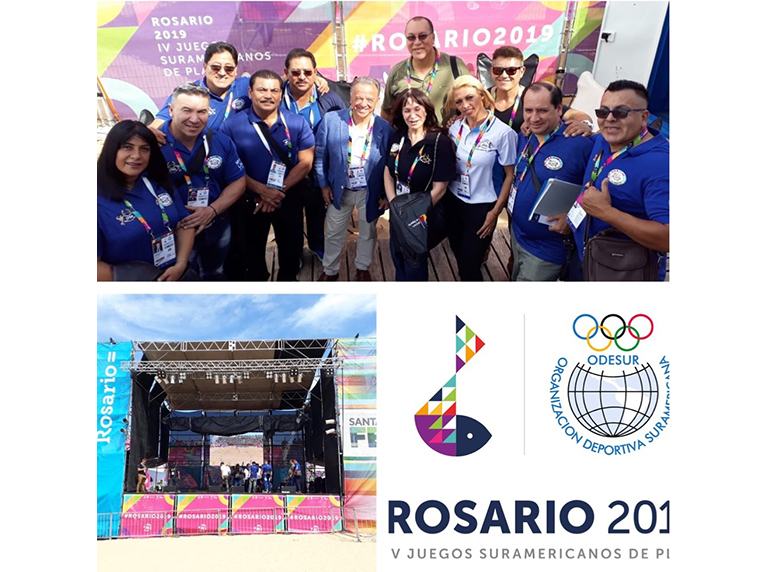 A new step forward for IFBB, in its progressive integration into Olympism, it represents the 2019 South American Beach Games that are being held in Rosario (Argentina), from 14th March until next Saturday 23rd. With its fully recognition in America, the IFBB is participating in this 4th edition of the Games, organized by the Olympic Committee of Argentina and the South American Sports Organization (ODESUR) chaired by President Mr. Camilo Pérez, who had a meeting today with Dr. Rafael Santonja, already in Rosario, attending the Bodybuilding & Fitness competition with other IFBB executives from America and Argentina. With the registration process completed today, the IFBB competition will starts tomorrow Friday 22nd, from 15:30 hour (local time), with the Opening Ceremony. Immediatly later, athletes from the 10 South American countries represented in the Beach Games will compite in the categories of Bikini Fitness, Men’s Physique, Classic Bodybuilding and Men’s & Women’s Fitness. Image: Led by President Santonja, IFBB officials from Argentina y South America are working in the development of Bodybuilding & Fitness competition, at the 2019 South American Beach Games.